The best Okey is totally free for android phones and tablets. 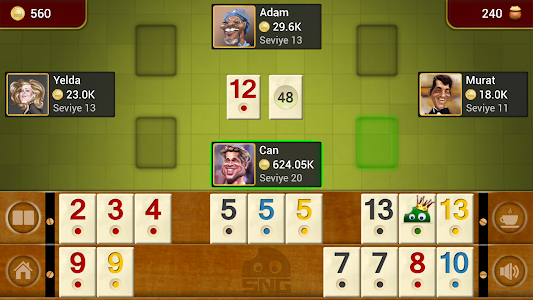 Okey is a board version of Gin Rummy Card Game. Our contribution is not only offline okey plus its room structure with virtual money and cash. It is a level based, progressive game with a very high re-playability value. ***** This game offers you hours of FUN for FREE. 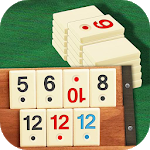 OKEY is a simplified version of the original Rummy. Scores are not kept. This version is more like a casino game, like poker or blackjack. 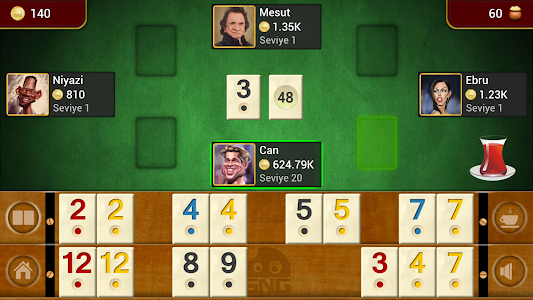 Each game is independent of the others and winner of a game takes the money on the table. The object is, by drawing and discarding tiles, to be the first to form a hand that consists entirely of sets of equal numbered tiles, and runs of consecutive tiles of the same color. 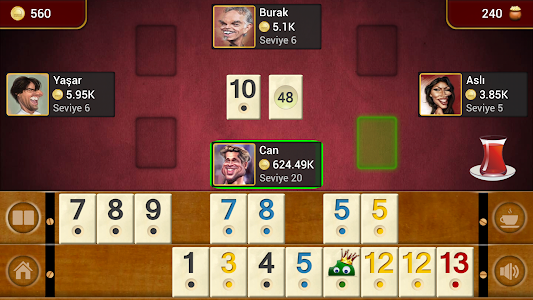 In order to win a game, all 14 tiles of player must be in a valid run or group. 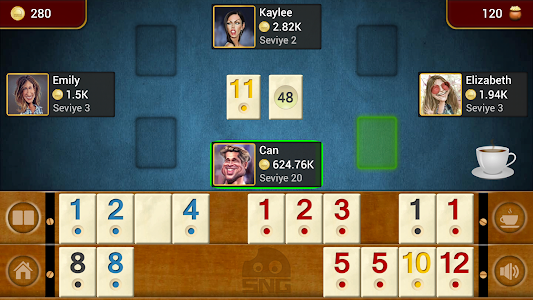 When there is no tile left out of runs and groups, player puts the 15th tile at the center of the table and wins the game. This game is totally free to play. 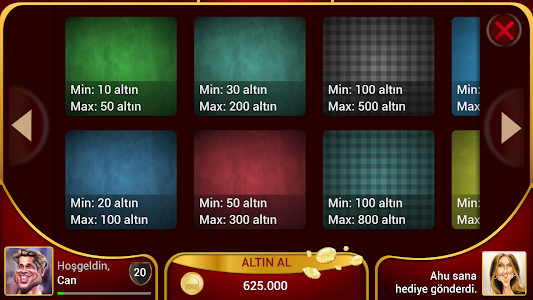 However, users who want to play with higher stakes might choose to purchase additional chips from in-game store. - You starts with 15 tiles. You set your 14 tiles by sorting serial or double pers. 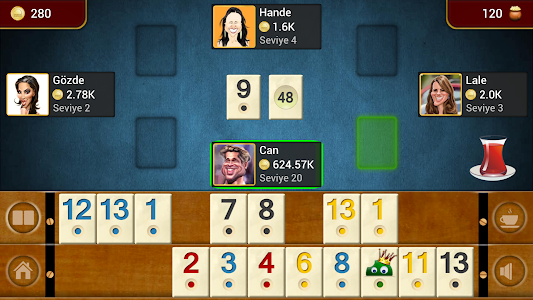 After sorting your 14 tiles, you move your last tile on middle of the table to finish. - Example of right serial pers: "1-2-3-..." (same colors), "11-12-13-1" (same colors), "5-5-5" (different colors), "7-7-7-7" (different colors) etc. - Example of wrong serial pers: "1-2", "12-13-1-2", "4-5-6"(different colors), "9-9-9" (same colors) etc. - Example of double pers: "1-1", "2-2", "13-13" (all same colors and same numbers) etc. - Indicator Tile: A tile which is opened tile on the middle of table. - Okey Tile: Okey tile is a tile which is one more than the indicator tile value but same color. 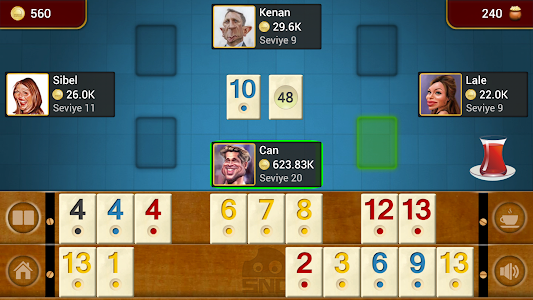 Okey tile can be used instead of any other tiles. * Increased stakes with increasing player level. * 24 different rooms with different backgrounds. * Various avatars to choose from. * Strong, but not impossible, AI opponents. Similar to "OKEY - Offline"